Every now and then we come across a coin lot description that impresses us. The last one occurred on May 23, 2013, about lot descriptions by Star Coin and Currency. Today we’re recognizing Southwest Bullion and Coin for its description of how to bid on a coin that may or may not bring high values. Justin Quinn, auctioneer, knows that coins by ICG, a reputable grading firm, can bring high crossover values if re-slabbed by PCGS. (Click picture above to expand.) 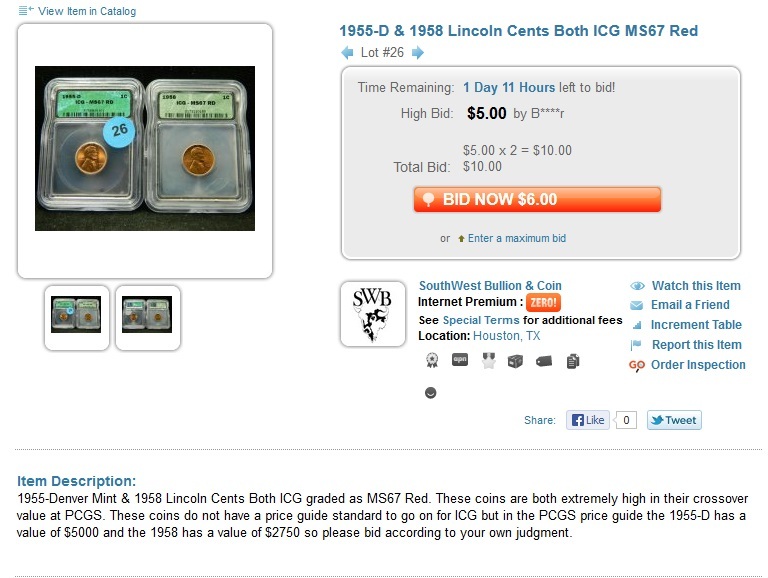 He doesn’t cite PCGS values for the coins as other auctioneers might do; rather, he states PCGS crossover prices without promising any return on the investment. This is how many numismatists earn extra income, including Proxiblog. See this Coin Update article to see how. This entry was posted in Best Practices and tagged American Numismatic Association, Auctioneers, AuctionZip, Best Practices, Coin Auction, iCollector, Justin Quinn, National Auctioneer Association, Proxibid, Proxiblog, Southwest Bullion. Bookmark the permalink.